I believe that all of us on this earth are destined to fulfill specific purpose in life and once that purpose is fulfilled we leave. We plan our future but as we move on in life we find ourselves on different path and doing something very different from what had been planned. We meet many people in our life time who help us in accomplishing things meant for us. They stay with us and once their purpose is fulfilled they depart. I will quote my example here – When i was studying MBA i planned to work in a good Multinational Company and earn good living. But today i manage my own software development business and am soft skills trainer at jaycees. I never planed about it but it was destined to happen. 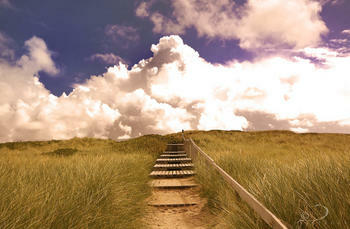 All ups and downs happens to teach us and walk our destined path. No one knows what will happen in future and what we will do 20 to 30 years down the line. Even the tarot card readers or Jyotish cannot predict the exact happenings. We need to wait and day to day happenings mold our future. Imagine a situation when every person had the same purpose to fulfill. There would be no unique work and no unique happenings. We all are gifted with different faces and different personality and no two person are a photo copy of each other. This specifically signifies that everyone has different obligations to fulfill. The honey bees are destined to pollinate flowers and make honey. It will never happen that some other insect will take its position and start collecting honey. Sometimes many of us feel insecure that our position will be hijacked by some one else but that might not be the case if we are destined to fulfill the purpose of that position. Everything happens in our life for a purpose and its written in our fate exactly at what time, what date and which second the specific incident will happen with us. We cannot avoid it but yes face it with a brave heart.